Click the above banner to download the “Disney Live! Auditions” flyer. Disney Live! is seeking Male and Female Dancers, Character Performers and Tumblers for the upcoming tour season. Specialty skills such as adagio, trampoline, puppetry, in-line skating and foreign language skills are a plus. Contracts run approximately 6-9 months with competitive pay, benefits and domestic and international travel. Casting occurs year round in conjunction with individual tour schedules. Please bring a non-returnable headshot and resume. We also accept photos of any Disney face character look-alikes you have portrayed. All performers will learn a dance combination. Ladies, please arrive with performance ready hair and neutral stage make-up. Gentlemen, arrive clean shaven. No hats please. You must be at least 18 years of age to audition. Disney Live! is a touring stage show produced by Feld Entertainment under agreement with The Walt Disney Company. Aimed primarily at children, the shows feature performers dressed as Disney cartoon characters in performances that each derive their music and plot from elements collected from various Disney films and properties; the “stars” of the show are credited as the Disney characters themselves, performing their parts in mock cameos, while the performers themselves remain anonymous. 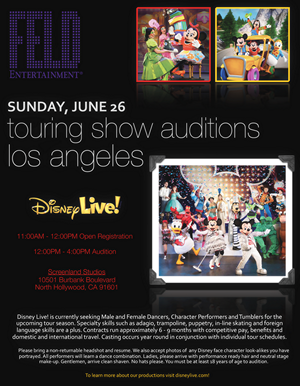 In 2004, Feld Entertainment expanded its long running relationship with Disney and embarked on a new venture with Disney Live!, a series of Broadway-quality, interactive touring theater productions featuring Disney-themed stories for families with young children. Disney Live! inspires children and their parents to jump up out of their seats to sing, dance and play along with Disney characters in three dimensional stage productions. Disney Live! presents Mickey’s Music Festival unites Mickey Mouse, Minnie Mouse, Donald and Goofy in an energetic mega music fest featuring beloved songs and characters from The Little Mermaid, Aladdin and Disney/Pixar’s Toy Story. Disney Live! Mickey’s Rockin’ Road Show whisks audiences on a wacky, fun-filled journey with Mickey Mouse, Minnie Mouse, Donald and Goofy as they embark on a talent search adventure filled with unexpected, exciting encounters and favorite Disney friends like Buzz Lightyear and Woody from Disney/Pixar’s Toy Story; Tigger; and Cinderella. Fun knows no boundaries in this cartoon come to life! Disney Live! presents Three Classic Fairy Tales finds Mickey Mouse, Minnie Mouse, Donald and Goofy guiding audiences on an enchanted adventure through the awe-inspiring and courageous stories of Snow White and the Seven Dwarfs, Cinderella, and Beauty and the Beast. Playhouse Disney Live!, for the first time, brings characters from four popular Playhouse Disney TV shows together live on stage for an unforgettable musical celebration. Playhouse Disney Live! takes audiences into the colorful worlds of Mickey Mouse Clubhouse, Little Einsteins, My Friends Tigger & Pooh and Handy Manny. Disney Live! presents Mickey’s Magic Show features world class illusionists along with Disney’s fabulous four – Mickey Mouse, Minnie Mouse , Donald and Goofy – showcasing a stunning sequence of magical acts. From the breathtaking levitation of Minnie and Aladdin’s Princess Jasmine to the transformation of Cinderella’s rags to riches, the illusions astound children and adults alike. The shows have played all over the world, including non-traditional Disney markets such as South America, the Middle East, and Asia; as well as more traditional markets such as North America, Australia and Europe. To learn more about Disney Live productions visit disneylive.com! 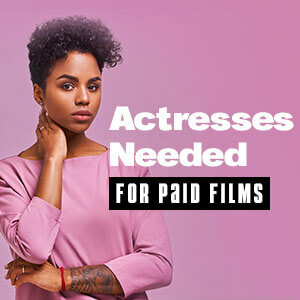 John Done is a casting auditions writer.